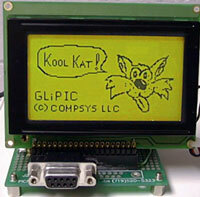 Software: GLiPIC and BINHEX were used to produce the following displays, both of which are available in the Benchware section. The 128x64 used as a mini-terminal, allowing the user to issue commands via a pc connection. The Samsung KS0108 is a graphics only controller and does not have an on board character generator. Compared to other controllers like the Toshiba T6963C, the KS0108 has a limited amount of instructions. However, it is quite easy to interface and program. My problem was trying to find documentation. The BG Micro, pamphlet gives some clues but no exact implementation. After numerous hours of hunting on the internet I found just bits and pieces. 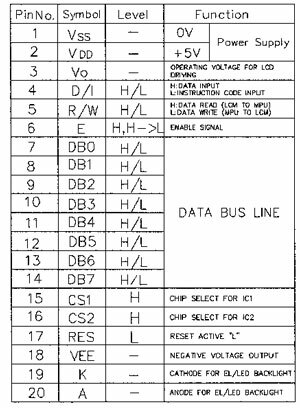 Most of what I found came from, Hantronix Inc. their documentation is very helpful, since they gave an example program written for an 8051 and from AZDisplays Inc.who provide excellent specifications in a pdf file. Both these displays are essentially the same except that the 128x32 only displays 4 pages (lines) at a time, whereas the 128x64 displays all 8 lines. 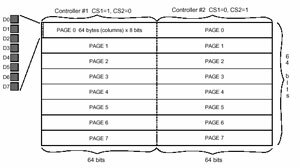 The KS0108 controller has 512 bytes of display ram arranged as 64x64 pixels. Each LCD module has two controllers! One controls the left side while the other the right side. The controller has an onboard power supply (Vee) for the LCD contrast. By connecting a 20k POT between Vee (Pin 8) and 5+v Vdd (Pin 2) with the pots wiper connected to Vo (Pin 3) one is able to adjust the LCDs contrast. Pins 19 and 20 are the cathode (K) and anode (A) of the backlit led. One should insert a 100-200 ohm resister in series with the anode to provide overload protection.